As environmental consciousness continues to rise, Foothill Funeral & Cremation Service remains committed to responsibly using natural resources. We understand that many of our families choose to consider ecological values when making their end-of-life arrangements. Foothill Funeral & Cremation Service continues to be among the most progressive funeral home in Southern California, offering the largest variety of options to our community. Green burial is yet another example of our dedication to accommodate the requests and diversity of the families we are honored to serve. Foothill Funeral & Cremation Service is one of a select few funeral homes who meet the criteria for providing green funeral service by the Green Burial Council; a tax-exempt, non- profit organization working to encourage environmentally sustainability in the field of funeral service. Our green packages allow for a funeral to take place without the use of toxic & Non-biodegradable materials/chemicals. Green burial is a form of interment designed to have minimal environmental impact, especially when compared to traditional burial methods. With this process, burials are performed using a natural woven casket or a shroud made of organic fabric. No preservatives or toxic chemicals are used, as no embalming is done during preparation of the body. of metal and concrete into the earth for perpetuity. 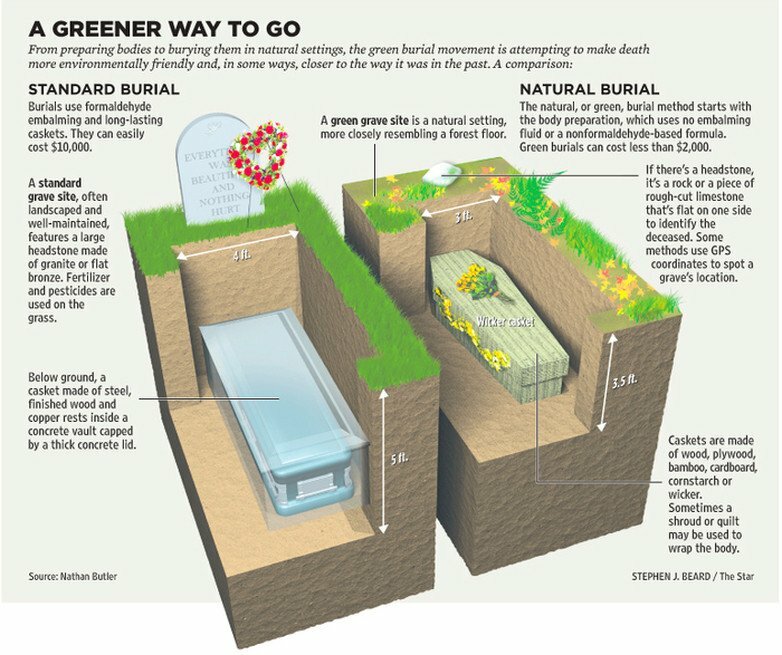 By contrast, green burial minimizes environmental damage while fostering a greater union with nature. Instead of contributing more imperishable waste to the environment, it nurtures the natural cycles of life. Green burial offers an eco-friendly process for our bodies to be returned to the earth, and a meaningful way to honor the life of a loved one. These Southern California Cemeteries have been certified as a Hybrid Cemeteries by the Green Burial Council, the leading accreditation agency in the green burial movement. As a Hybrid Cemetery, they are able to offer families the choice of green or traditional burial. Joshua Tree Memorial Park (Joshua Tree)This cemetery is located near the Joshua Tree National Park and has a small section set aside from its conventional cemetery to accommodate green burial. This cemetery is approved by the Green Burial Council as a hybrid burial ground. Eternal Meadow is a naturalistic wildflower meadow garden thoughtfully designed to emphasize the sanctity of life and harmony with nature. The space features a diverse mix of grasses and wildflowers native to California that display a natural cycle of flowering, degeneration, and re-seeding throughout the year. Traditional Jewish burial rituals have been “Green” for thousands of years, being performed without a casket, symbolizing the return to the Earth and the dust from which you were created; honoring the natural process intended for our bodies to be reunited with the earth. The key difference between "Gan Eden" and the rest of the park is that burials are performed in biodegradable caskets or shrouds with no concrete vaults or liners placed in the interment space. Full-Body Burial at Sea offers a more natural, eco-friendly method of returning our body to nature. With the help of natural microbial processes, time, and corrosion; even the wood or metal casket will eventually break down and disperse into its basic natural elements. Burial at sea has been a time-honored tradition for mariners and those with a fondness of the ocean for thousands of years. Full-Body burial at sea can be performed using a casket or the body can be specially wrapped in a natural shroud. With either option, interment is carried out in approved federal waters off the coast of Long Beach, California. Foothill Funeral & Cremation Service has a unique offering of Funeral Merchandise. From Handmade Caskets for burial or Cremation to Urns made from Himalayan Sea Salt, Sand or Flower Seeded Paper. We also carry the BioUrn in which your cremains would become part of the ecosystem of a living tree.